Despite public denials from the White House, the AP reports that behind the scenes the president's team is insisting some Republican proposals to gut the Clean Air Act must be included in a bill to fund the government through September 30th. If these reports are true, this would be a betrayal of the American people's demands for strong protections against all kinds of pollution -- not to mention a betrayal of millions of voters and volunteers who supported the president in 2008 because of his positions on climate change and the environment. First, the president failed to push through Congress a comprehensive climate and clean energy bill as he promised he would. Now he seems willing to sell out his own EPA's regulations of climate pollution -- the best tools we have right now to deal with climate here at home -- to get a spending deal from Congress. Every American who cares about clean air, healthy communities and the dangers of climate change should be outraged that this giveaway to dirty polluters is even being discussed -- I know I am. The health and welfare of every community in this country and around the world will be jeopardized if Obama allows Congress to gut the Clean Air Act. Shame on you, Mr. President, for even putting this on the table. 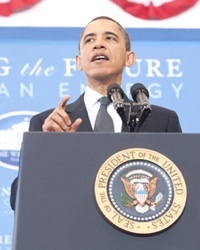 On Wednesday, President Obama addressed the energy crisis in a national speech from Georgetown University. As many have pointed out, this was a huge opportunity for him to reframe the energy debate, push for less dependence of fossil fuels, and remind the American public that high gas prices are part of a larger problem: a dependence on high-risk fossil fuels like oil and coal. The president not only missed the opportunity to fight for a clean energy future, he actually turned his back on it. In his only mention of potential energy sources, the president placed dirty coal, wind, and solar in the same category of clean energy alternatives. To lump coal together with truly clean energy sources like solar and wind is just ridiculous. Coal has never been and will never be a clean energy source, unless you count pumping billions of toxic tons of carbon pollution, lead, arsenic, and mercury into the air as "clean." As a mom, I would say that is about as far from the "clean" I want my son exposed to as we can get. In addition to praising the virtues of dirty coal, the president took the opportunity to pose a "solution" to our energy problems: more drilling. Reduce our dependence on big oil? No, that would hurt profits and CEO bonuses. Drill more? That will apparently solve all our problems. The president was right on one point: the reason we keep seeing seesawing energy prices is because we are dependent on high-risk dirty energy that hurts our wallets, our families, and our climate. But the solution is not to transfer more of that risk home; it is to find less risky sources of energy. Though I was happy to hear the president specifically mention climate change and the need for the U.S. to rise to the challenge of a cleaner energy future, the fact is it just isn't enough. Even what little he mentioned was for the larger priority of drilling for more oil. I am outraged that it all sounded like a page from the Koch brothers' "Americans for Prosperity" policy manual. We know their messaging is strong, but that's all the more reason for President Obama to push back on it. We need him now, more than ever, to stand up forcefully for a clean energy economy and climate action. Look, we get it: pressure from industry is mounting to all-time highs, with money pouring in at record levels. The election season is, as always, right around the corner. Just last week, when our volunteers hit the Hill to talk to their elected officials, we heard it time and time again: industry is killing us on this -- where are folks on the ground? So yes, we are deeply disappointed. But the thing is, we also should be disappointed that we, as people who care about climate change, weren't louder on this issue. It's time for us to also rise to the standard we ask of the president -- to stand stronger, louder, and more united. We have to give the president something to respond to rather than just something to lead on by building a stronger movement. That's our calling right now. The world depends on this movement getting stronger and louder. This speech, along with reports about the possible gutting of the Clean Air Act as part of a spending bill, must force us to work harder to build the grassroots climate movement we need. We are at a crossroads. Our words alone are not strong enough to counteract the money poured into our politics by big polluters: it is time to organize and act.